IRELAND’S SAM BENNETT had to settle for second place in the 13th stage of the Giro d’Italia, just 24 hours after claiming his second stage victory of this year’s race. Italy’s Elia Viviani of the Quick Step team won the stage in a sprint finish to mark his third success of the event this year. The 29-year-old Viviani had struggled on Thursday but hit back for his fourth stage success in total after back-to-back successes in Tel Aviv and Eilat in Israel. 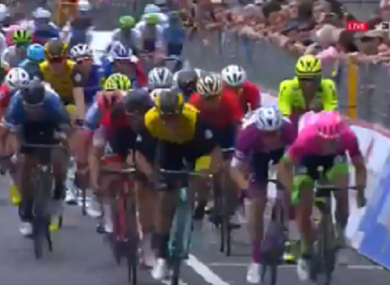 Wearing the points leader’s jersey, Viviani produced a late burst of acceleration in the dying metres to finish ahead of Bennett in a dramatic push for the finishing line. Bennett became the first Irishman to win a Giro d’Italia stage since 1987 on Friday after he powered to victory in the seventh stage of the race. The Bora-Hansgrohe rider claimed the 12th stage yesterday after breaking away in the final 400 metres on the Imola motor racing circuit. "He's in winning ways again!" Dutch rider Danny Van Poppel took third place ahead of Italy’s Sacha Modolo on Friday. The 180km stage from Ferrare and Nervesa della Battaglia suited the sprinters covering flat roads of the eastern Po Valley. Britain’s Simon Yates (Mitchelton) holds the leader’s pink jersey on the eve of a gruelling mountain stage to the summit of Monte Zoncolan. Email “Ireland's Sam Bennett must settle for second place at stage 13 of Giro d'Italia in sprint finish”. Feedback on “Ireland's Sam Bennett must settle for second place at stage 13 of Giro d'Italia in sprint finish”.